In the current unit we’ve been doing in art class, we were focussing on line drawings, and what makes them beautiful. We started by testing varied drawing techniques. Ms. Rude (our art teacher) handed out two sheets, one was trying to match lines, with different textures. The other, was colouring in trying to show shade with different line techniques. In the one with textures, we used thin, thick, scumbling, hatching, cross hatching, and even random lines. After finishing this one, we used these techniques to show shade. Hatching, cross hatching, scumbling, and random lines. I think everybody did well on this one, because when I looked at them, I could clearly see the shade, and the light source. After practicing with many techniques, and using them in a barn drawing, we tried one of Van Gogh’s line drawings. We had to draw the same picture, but we could use different line techniques on different textures, if we wanted. As long as we used the same objects in the same spots and such. While making the drawing, I noticed that I’m not very good at hatching. Making out the curves of the trees was tough. A technique I could have used, is a curved line to make things jump out of the picture. After drawing many lines, we began our comparison, of two artists, and one of their line drawings each. I chose a portrait made by Dürer in Germany he lived from 1471 to 1528. He was 13 years old when he made it in 1484. 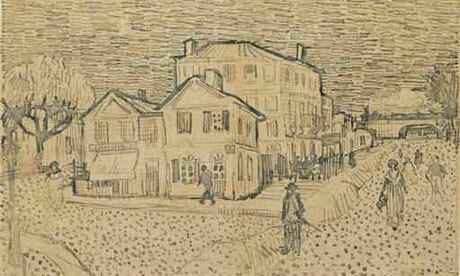 The other drawing I chose, was made by Vincent Van Gogh in Paris. He lived from 1853 to 1890. “The Genius of Albrecht Dürer Revealed in Four Self-Portraits.” Open Culture. N.p., n.d. Web. 08 Apr. 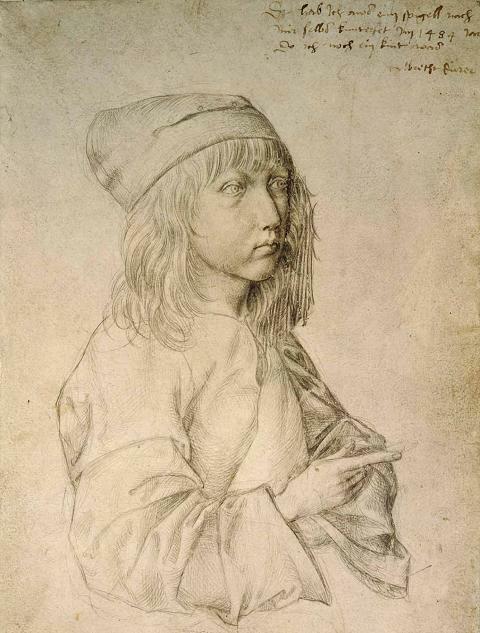 2014<http://www.openculture.com/2013/07/the_genius_of_albrecht_durer_revealed_in_four_self-portraits.html>. This is Van Gogh’s landscape. Kennedy, Maev. “‘Lost’ Drawing in Van Gogh Auction.” The Guardian. Guardian News and Media, 13 June 2003. Web. 08 Apr. 2014. <http://www.theguardian.com/uk/2003/jun/13/arts.artsnews>. The last, and main part of our unit, was the final line drawing. We had about 2 to 3 weeks, to complete it. All we had to do, was pick a black and white picture, and draw it with a sharpie. Although this sounds simple and quick, it is quite the opposite. It took me 7 or 6 hours to finish this drawing, and it included so many things. I think that one of the challenging parts was that it had to be 50-50 black and white. Although I don’t think I reached that goal, I think I got well within the 35-65 range. We also had to include many drawing techniques. I only used 5 line techniques, but this was due to the fact that there weren’t many textures in the picture. Only clouds, trees, a balloon, and the sky. I think I could develop some of my strategies by practicing more interesting textures which may even use more than 2 line techniques. Maybe a carpet or window curtains. Making the artwork was challenging, and I really had fun. I believe I could improve with adding more drawing techniques, and making those shades really pop out. I think I’m pretty good at using some techniques already, but I could improve in the random lines technique. It doesn’t really look good. During field studies we were asked to draw and write about our day in our visual journals every night. We had to use the space of 1 or 2 pages per day. On the first day of field studies I had no idea how to start off or what to draw, so I decided to draw the main and most climactic point of the day. I also decided that for these points, I could use the different drawing techniques that we learned in class. On the fourth day, because the time that I was drawing was at night, colours were not very visible so I used a contour drawing style to get the outlines and shapes that I saw. Something that challenged me, was just drawing in general. I am not a very good drawer, and it takes me very long to make a simple drawing, so it was hard for me to finish the drawing in time. Also, some drawings needed to be larger to get the big picture so I needed more detail, like the mountain that I drew. If I were to do this assignment again, I would use more colour, try different mediums such as: water colour, coloured pencil, and possibly marker, and also I would place more pictures and drawings on the pages. I think this would help to make my visual journal much more attractive and interesting. This is the second page in my visual journal.